LG has been making a strong effort to upgrade its position in the high-end smart phone market and recently released the V40 Thin Q model. XDAdevelopers reports that LG’s OLEDs have moved from the “worst viewing angles” on an OLED with the blue shift on the Pixel 2 XL, to the best viewing angles on a mobile display and completely without the jarring red/green striated mini-shifts as seen on many angles on even the best of Samsung’s displays, which wasn’t present on the Pixel 2 XL and LG V30 display, However, because of how LGD tackles angular shifts, they have now surpassed Samsung. In display brightness, the LG V40 ThinQ is comparable to the best of the best in OLED, plain and simple. In color accuracy, LG Mobile is most likely to blame for the calibration, as the color accuracy on the LGD panel on the Pixel 3 is phenomenal. One of the latest improvements Samsung has made to their OLED DDICs is their dynamic brightness control, which allows calibrated display profiles to target a specific display gamma much more accurately, resulting in faithful color tonality and even greater chromatic accuracy, which is done by either limiting the voltage of the display TFTs, regardless of APL/voltage load, to its capacity at 100% APL TFT voltage load, or increasing the applied voltage at higher APLs. Since the peak brightness of Samsung’s displays at 100% APL have not increased, it seems they have applied the former. 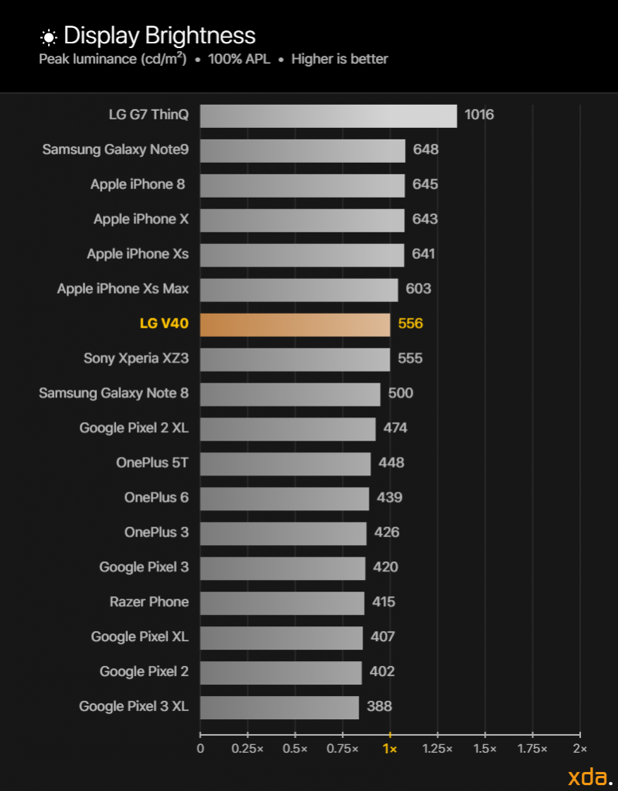 LG Display has now implemented the technique in the LG V40 by their peak brightness readings at different APLs. Samsung did not implement this until the Galaxy S9, and the Samsung panel and DDIC in the Pixel 3 XL use the same tech. However, this was not evident in the Pixel 3’s LGD-made OLED, so it is not yet known if it is LGD’s proprietary DDIC tech or if they will ship it out with their panel package. Improvement in some of the last, hard-to-perfect characteristics is what is needed to perfect the display separating the good from the best of the best, which are now reserved to the iPhone X-series displays. ​Most modern flagship smartphone displays now come with calibrated color profiles that are chromatically accurate. However, due to OLED’s property of lowering the average lightness of the colors on the screen with increasing content APL, the main difference in the total color accuracy of modern flagship OLED displays is now in the resulting gamma of the display. The gamma of a display makes up the achromatic (grayscale component) image, or the structure of the image, which humans are more sensitive in perceiving. Therefore it is very important that the resulting gamma of a display matches that of the content’s, which typically follows the industry standard 2.20 power function.